I visited Eastbourne for the first time last year and had such an amazing day that I was certain that I must visit again this year! I had been waiting for this day for agesss and as you can imagine, I was literally bouncing off the walls with excitement! The line-up for this year was particularly impressive with the top 4 seeds of Zvonareva, Li , Schiavone and Azarenka; perhaps the biggest excitement was that both Venus and Serena Williams were making their return from injury. 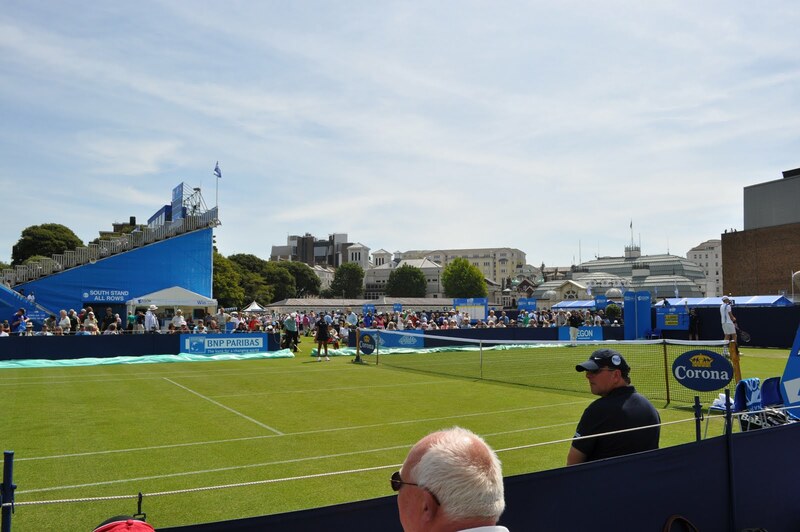 The tennis at Eastbourne is based at Devonshire Park, a short 10-minute walk from the train station. The venue is similar in size to Queens but is much more spacious and presents a much more intimate feel that allows you to get much closer to the players. I lost count of the number of the players I walked past and felt like a kid in a candy store! The best spots of the day were walking past Sam Stosur, standing verry near to Venus Williams whilst watching Pavlyuchenkova and Jovanovski play, and Petra Kvitova and her coach laughing as they watched her potential opponents play on an outside court. After a short wait at the train station for my tennis companion, Tash we headed straight to the practice courts. It is fantastic how close you can get to the players without having to jostle your way through huge crowds like at Wimbledon! We managed to get a glimpse of a number of players including Venus Williams, Shahar Peer, Tsvetana Pironkova, Maria Jose Martinez Sanchez and Francesca Schiavone, who was all smiles as she acknowledged some of her younger fans watching behind her. 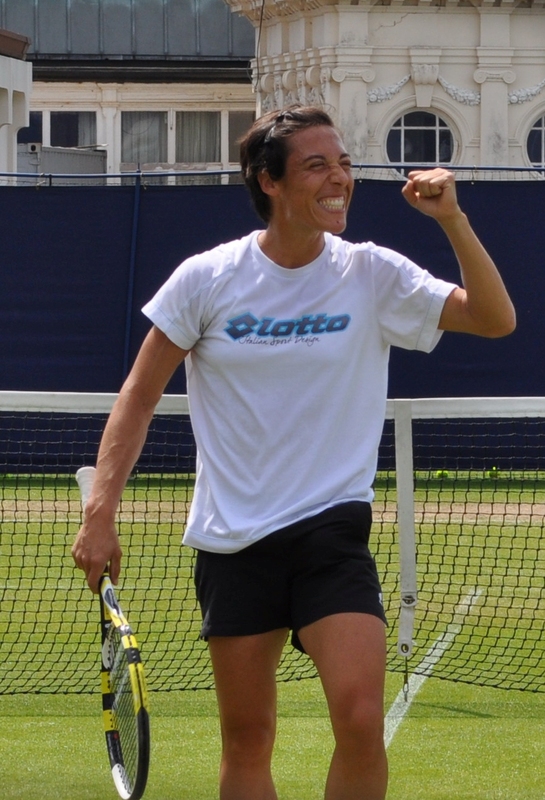 It was interesting to note that Schiavone was grunting just like she does during the match. This is compared to the likes of Sharapova and Azarenka who are completely silent in practice and then turn into animals on the court. We then headed over to centre court for the first match of the day between Ana Ivanovic and Julia Goerges. I was very happy with our seats which were in the South Stand, seven rows from the front. 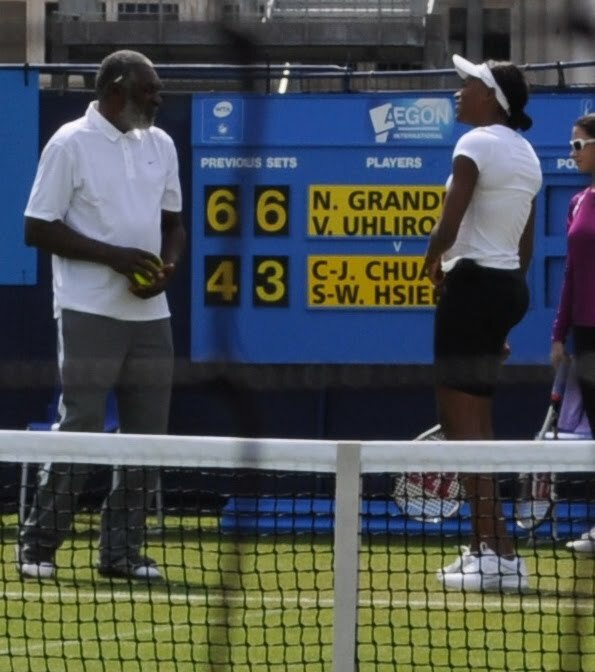 The first match was a potentially exciting encounter which had been put in our order of play rather controversially ahead of the number 1 seed, Vera Zvonareva against a British player in Heather Watson. 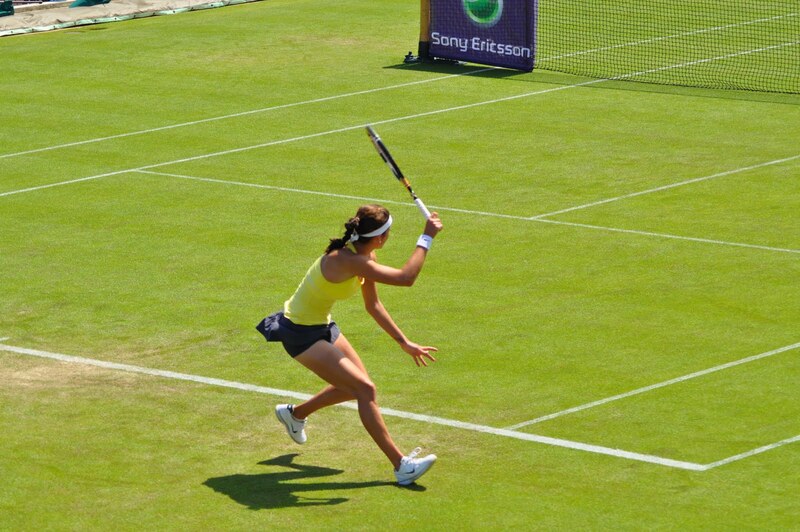 It turned out to be a mistake by the schedulers as Ivanovic and Goerges battled out a rather poor match. Goerges started well as she dominated with her huge groundstrokes off both sides and quickly raced into a 4-2 lead as Ivanovic struggled for any consistency on her serve. Ivanovic was sluggish from the start and served up a number of alarming double faults with her wild ball toss. I’m no expert at analysing serves but she has serious issues in this department! The ball toss fluctuates from one point to the next and she seems to rather collapse on the ball. Ana’s serve did improve a lot during the first set and she hit a number of sparkling aces as the match went on. However on the other side of the net, Goerges was having major issues of her own. She served up a huge number of double faults, many of them on crucial points. The serve is one of Julia’s big weapons, which helped her to make a huge breakthrough during the clay court season as she won the WTA event in Stuttgart, and twice conquered world number 1, Caroline Wozniacki. The serve today was the worst I had seen it and she struggled to get any rhythm on it as her game started to disintegrate. Ivanovic gained the break back to level the first set at 4-4, and then rather quickly wrapped up the first set which was dominated by a mixture of stunning returns, glaring double faults and very few exciting rallies. Goerges was put under immediate pressure in the second set but battled well to win her first two service games. Ivanovic was playing some consistent and solid tennis and eventually made the deserved breakthrough at 3-2. As the errors kept flowing from Goerges, Ivanovic raced to the finish line and she won the match after Goerges went wide and long on a return to record a 6-4 6-3 victory. Personally, I wouldn’t fancy either Ivanovic or Goerges to be a threat at Wimbledon – however it was nice to see two new players to add to my “seen live” list! NEXT – THE RETURN OF SERENA! 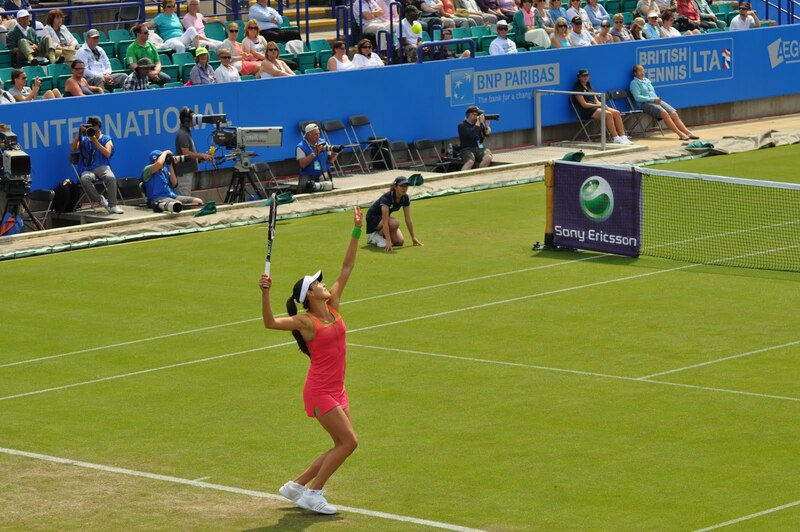 June 15, 2011 in Eastbourne, Goerges, Ivanovic, Schiavone, Venus.